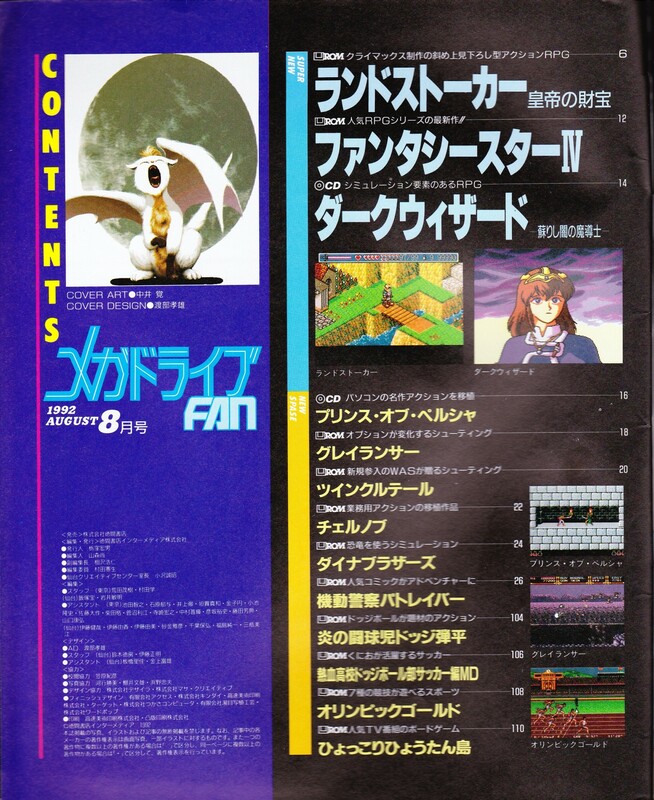 Japanese gaming magazine Mega Drive Fan was a major source of news about the Sega Genesis and Sega CD back in its day. 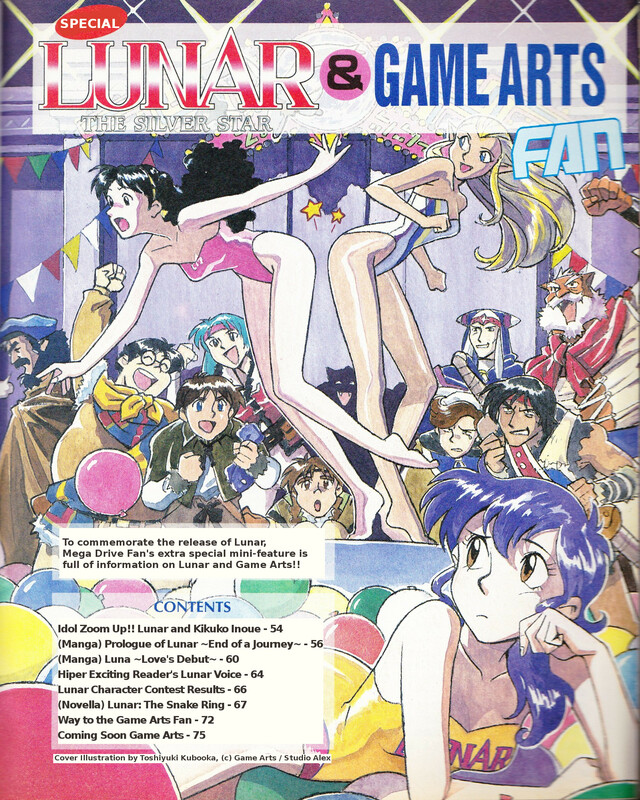 In August 1992, just months after the release of Lunar: The Silver Star, they ran a special feature devoted to the game and its development. Thanks to forum member Arlia, we've obtained this incredibly hard-to-find issue and are providing it for you here! 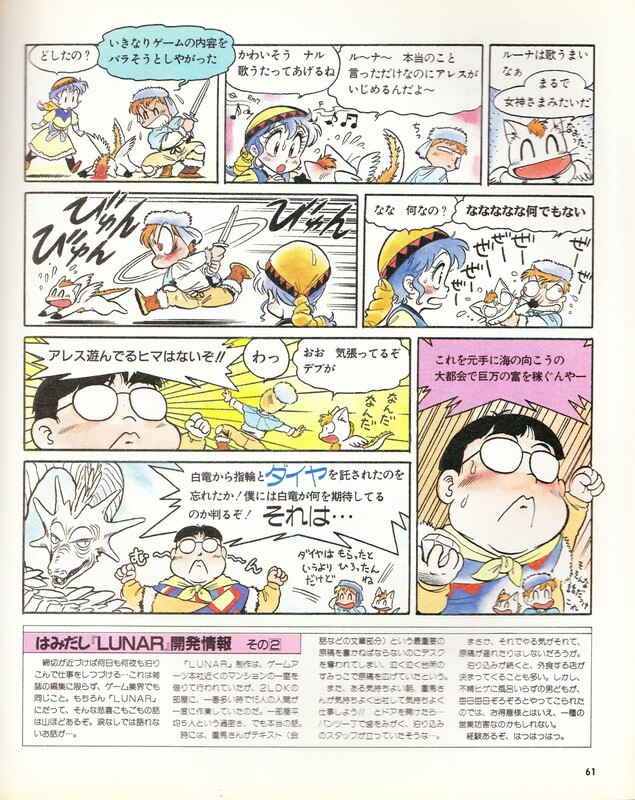 Issue #8/1992 of Mega Drive Fan ran a special feature devoted entirely to Lunar: The Silver Star and its development. 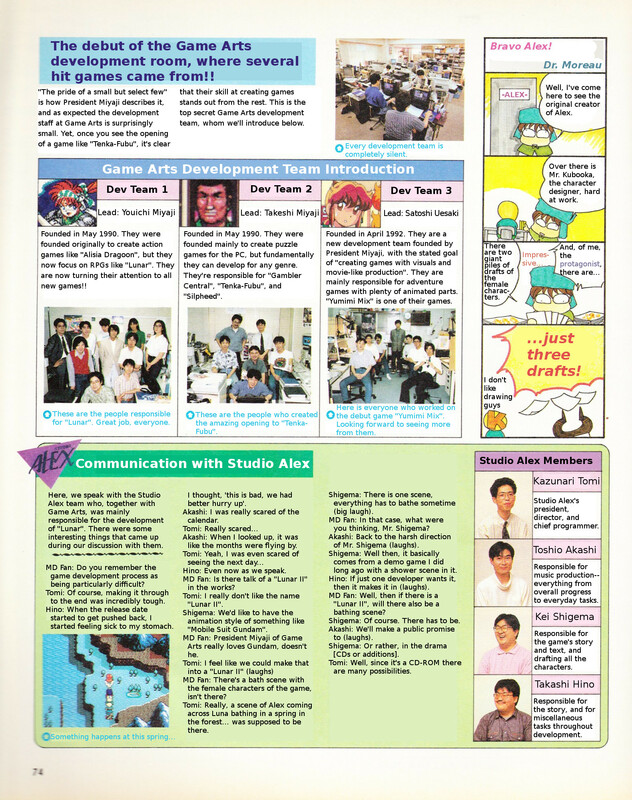 In all, it includes: an interview with Kikuko Inoue, two short manga features, fanart, results of a character contest, a short story, and a feature on Game Arts. 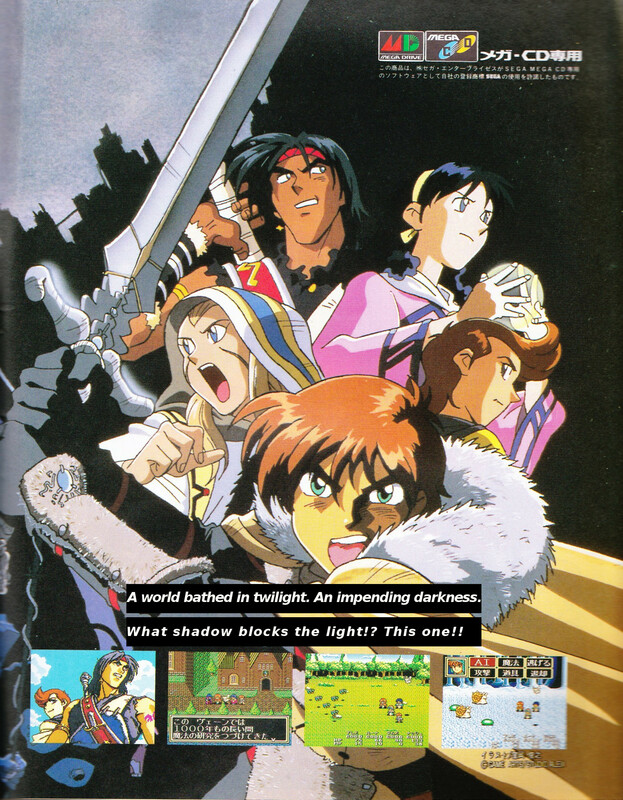 It also had separate features on some other games released around the same time, such as Phantasy Star IV and Dark Wizard. 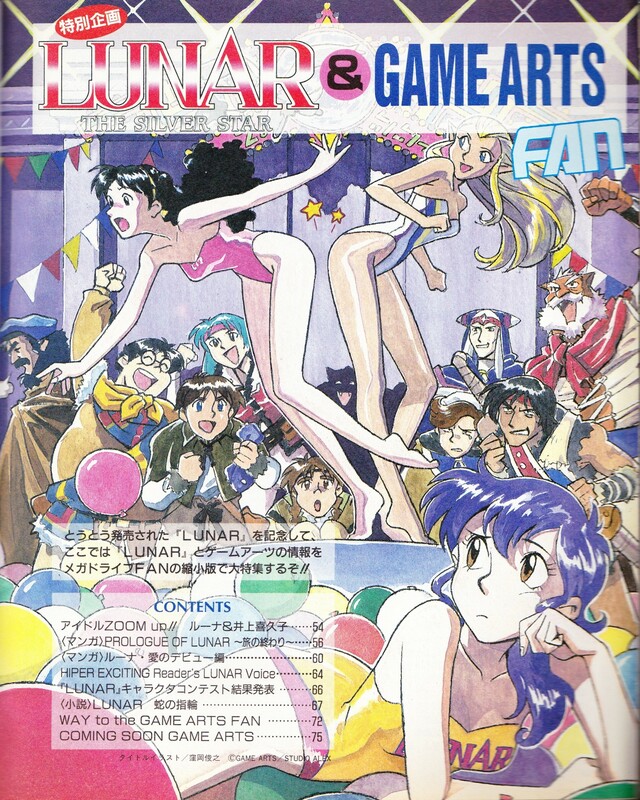 Magazine cover and description of games featured in this issue. Table of contents, first page. 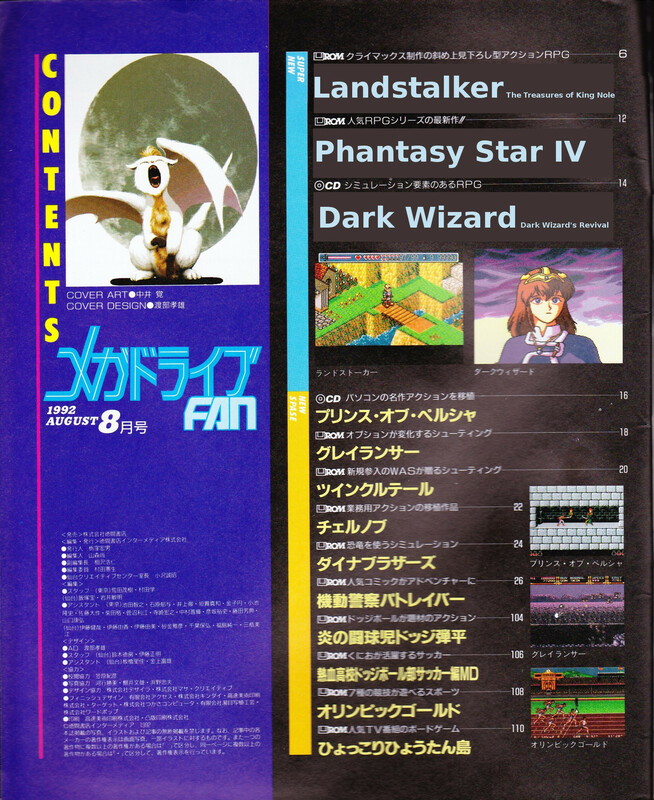 This also has Landstalker, Phantasy Star IV, and Dark Wizard mentioned. Other honorable mentions are Prince of Persia, Gleylancer, and Atomic Runner Chelnov. Table of contents, second page. 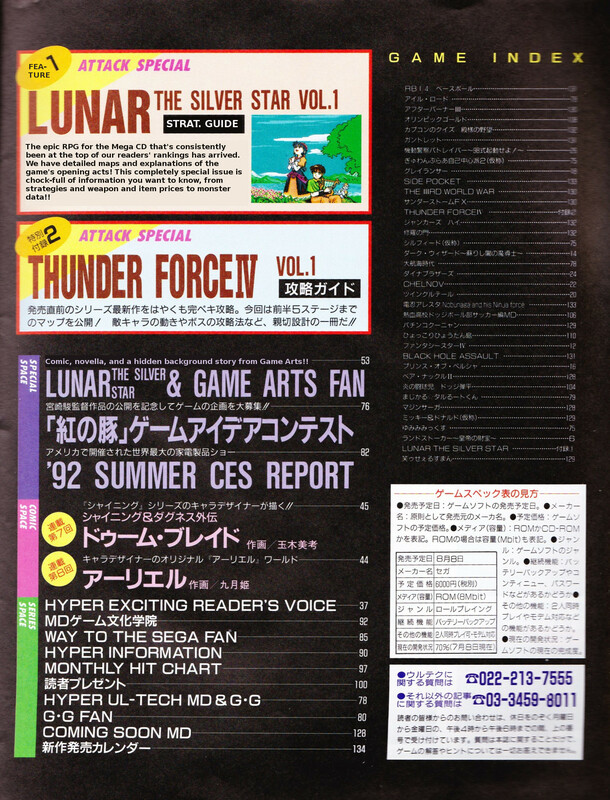 This highlights this issue's special features, including Lunar: The Silver Star and Thunder Force IV. 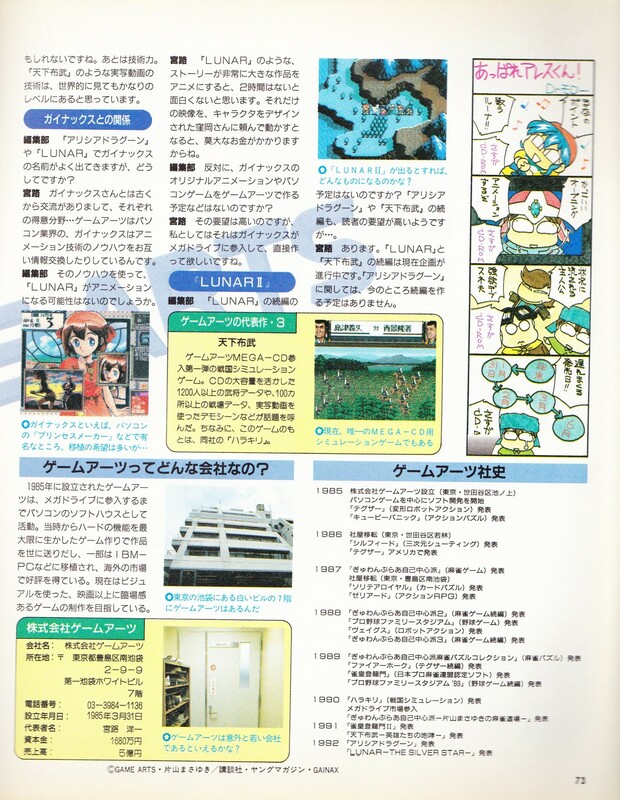 Other honorable mentions are a Porco Rosso game idea contest and a report of the 1992 US Consumer Electronics Show. (No translation available) Phantasy Star IV special. Includes game and series overview. 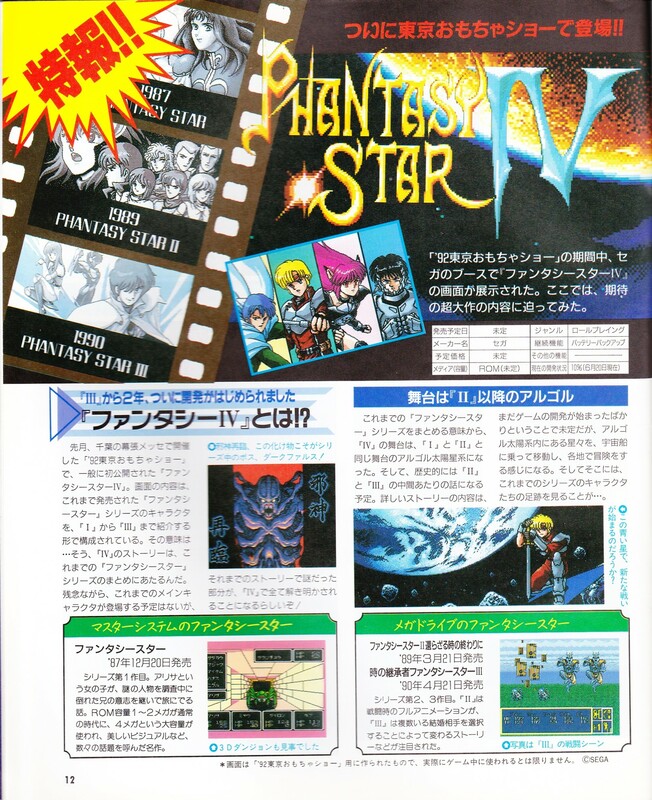 (No translation available) Phantasy Star IV special. Includes interviews. Table of contents for the special feature on Lunar: The Silver Star and Game Arts. (No translation available) Interview with Kikuko Inoue. 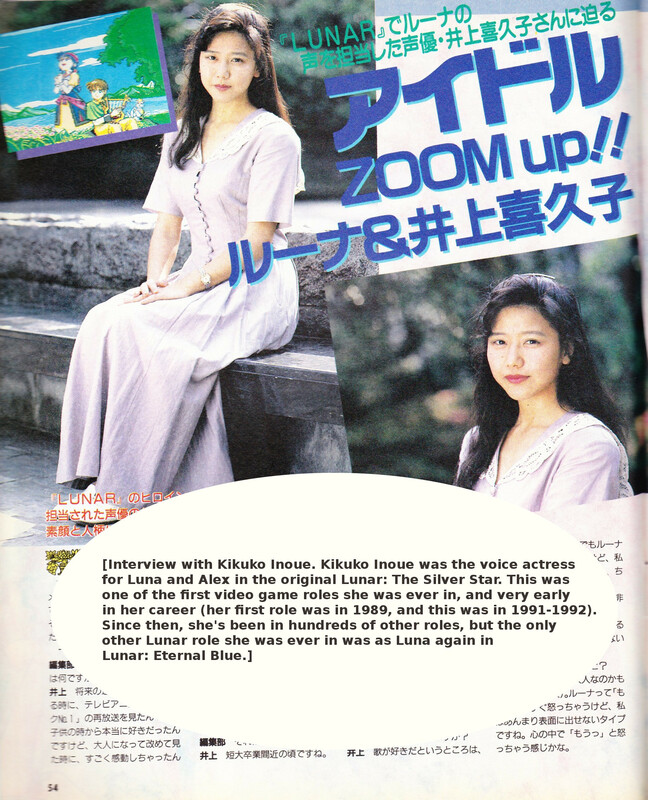 Kikuko Inoue was the voice actress for Luna and Alex in the original Lunar: The Silver Star. 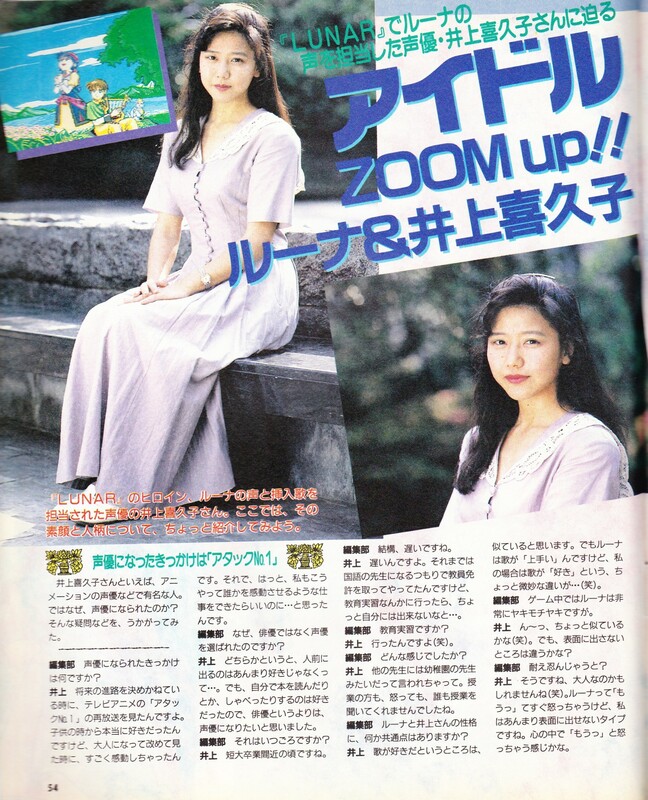 This was one of the first video game roles she was ever in, and very early in her career (her first role was in 1989, and this was in 1991-1992). 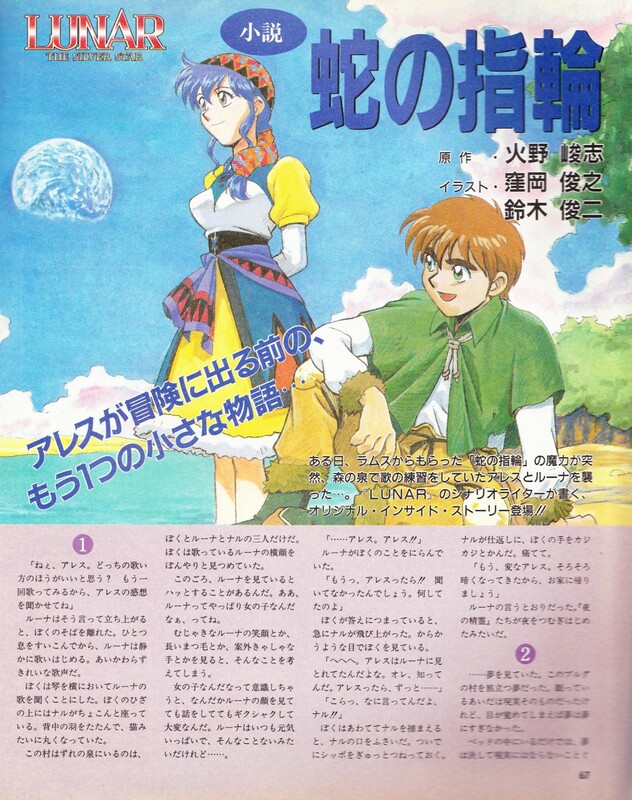 Since then, she's been in hundreds of other roles, but the only other Lunar role she was ever in was as Luna again in Lunar: Eternal Blue. 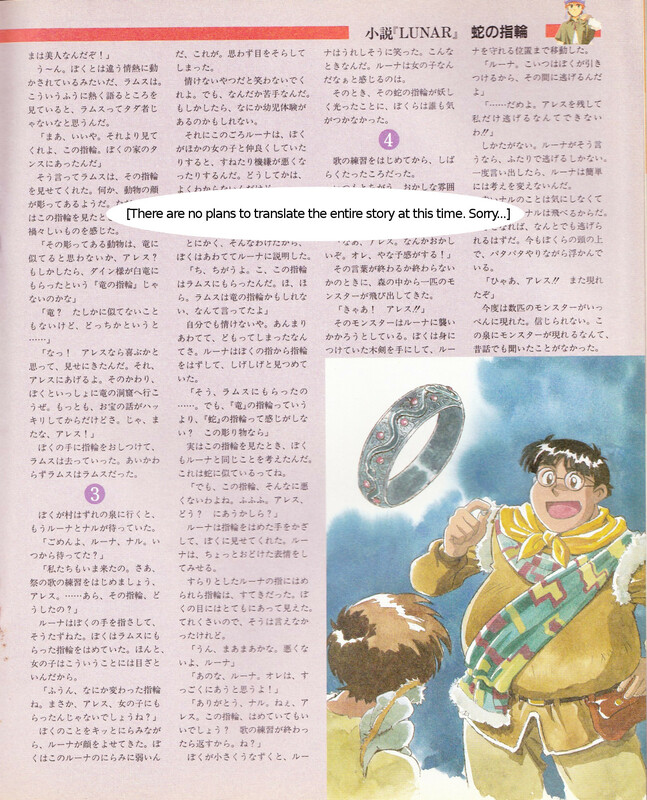 (No translation available) Sorry, this interview is long and we don't have plans to translate it right now. All I'll say is that Kikuko Inoue is seventeen. 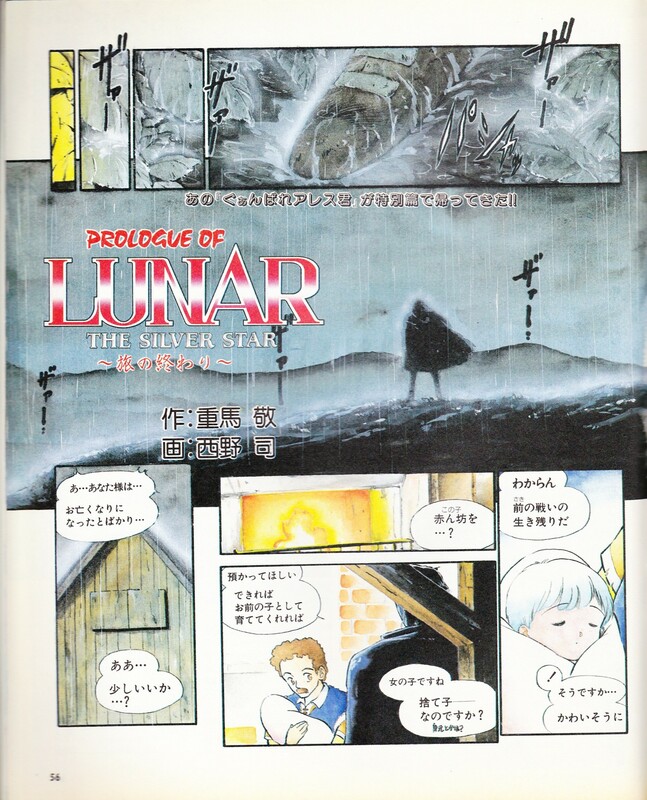 (Manga feature 1) Prologue of Lunar: The Silver Star, End of a Journey. Page 1/4. 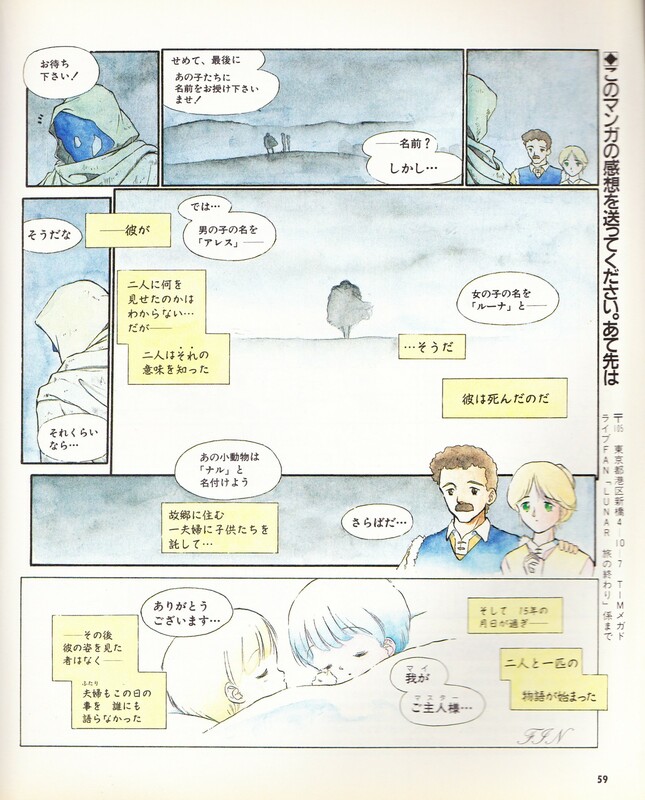 This tells the story of the night that Dyne visited Alex's parents and left Luna and Nall in their care. 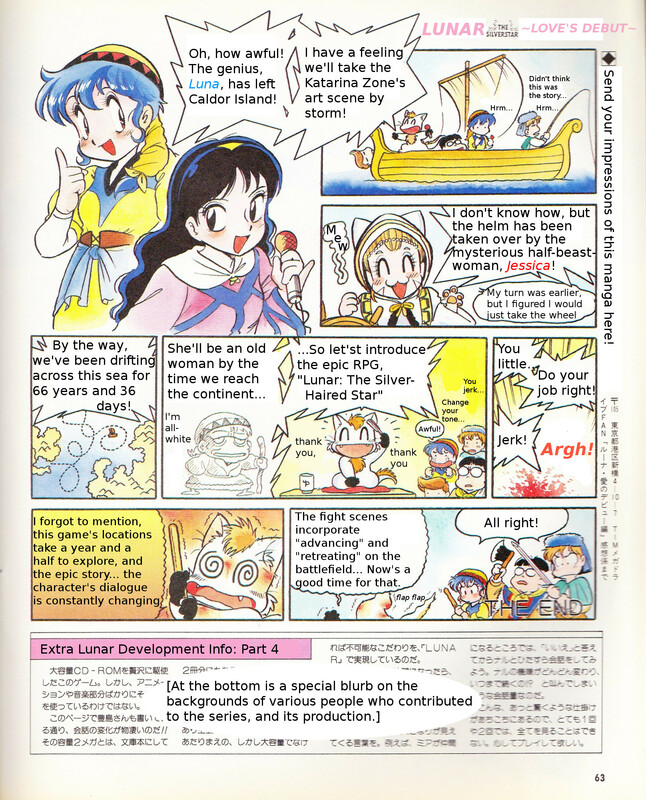 (Manga feature 1) Prologue of Lunar: The Silver Star, End of a Journey. Page 2/4. 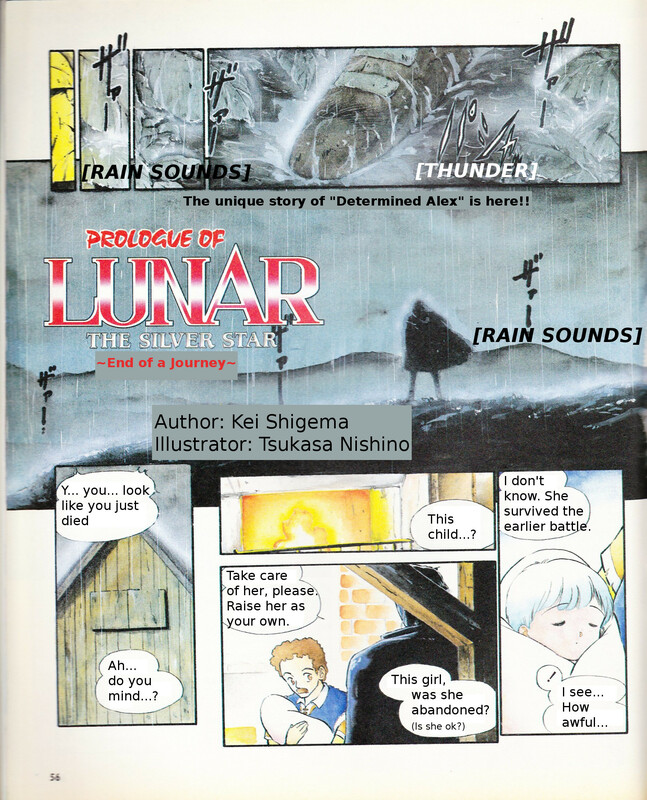 (Manga feature 1) Prologue of Lunar: The Silver Star, End of a Journey. 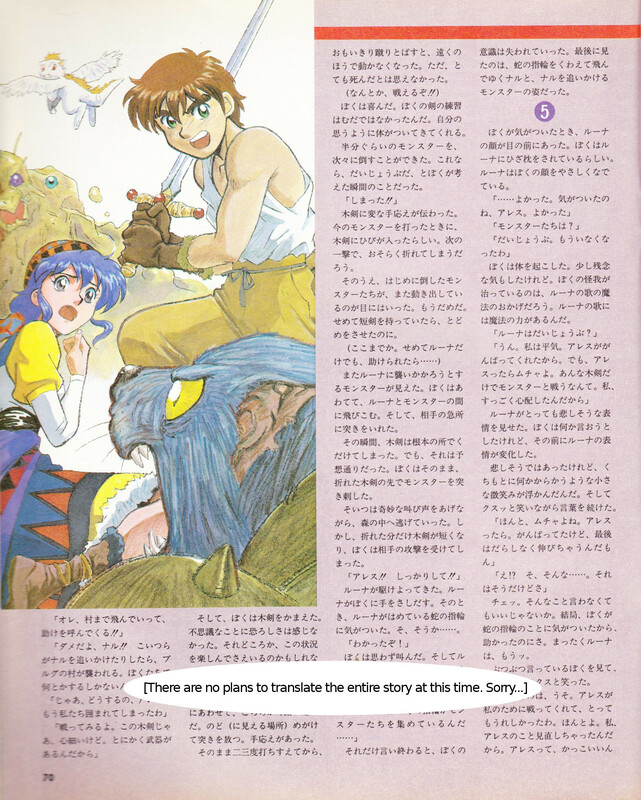 Page 3/4. 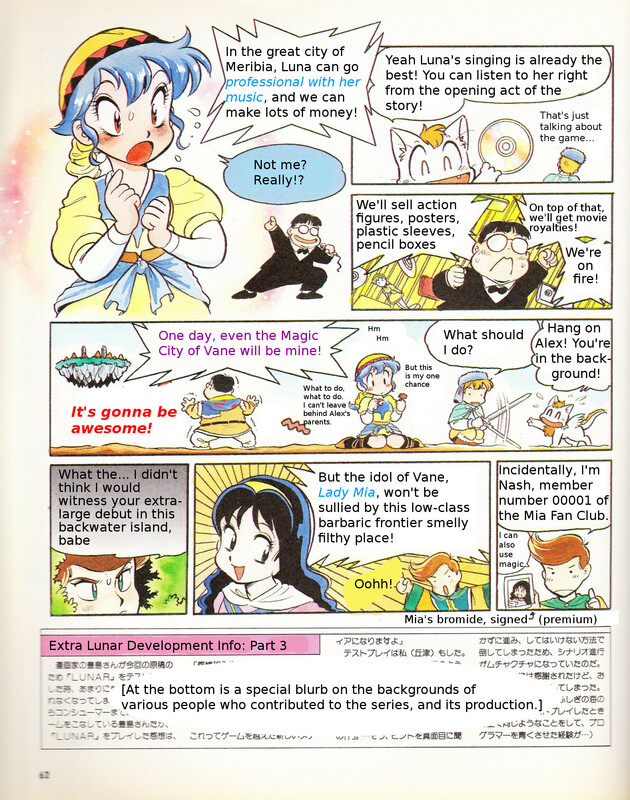 (Manga feature 1) Prologue of Lunar: The Silver Star, End of a Journey. Page 4/4. (Manga feature 2) Lunar: The Silver Star, Love's Debut. Page 1/4. 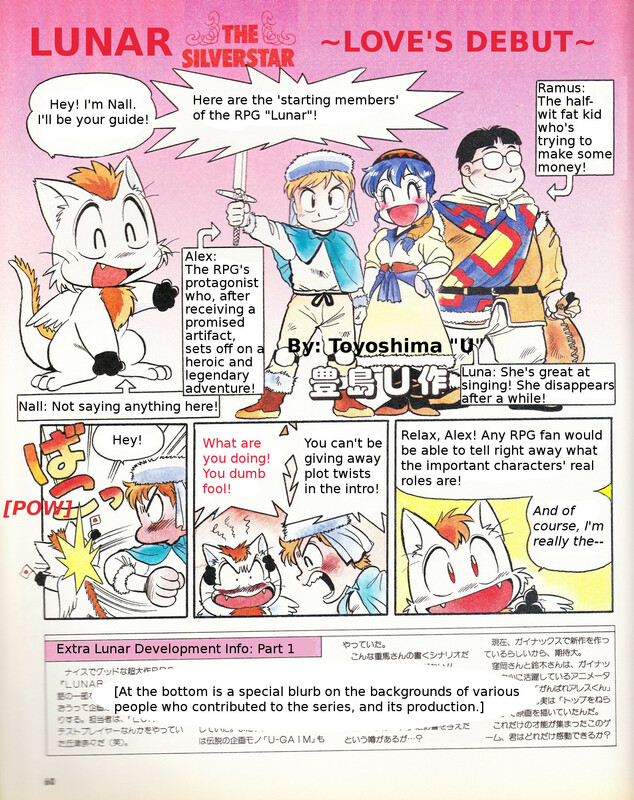 This is a little feature of Nall introducing the cast. 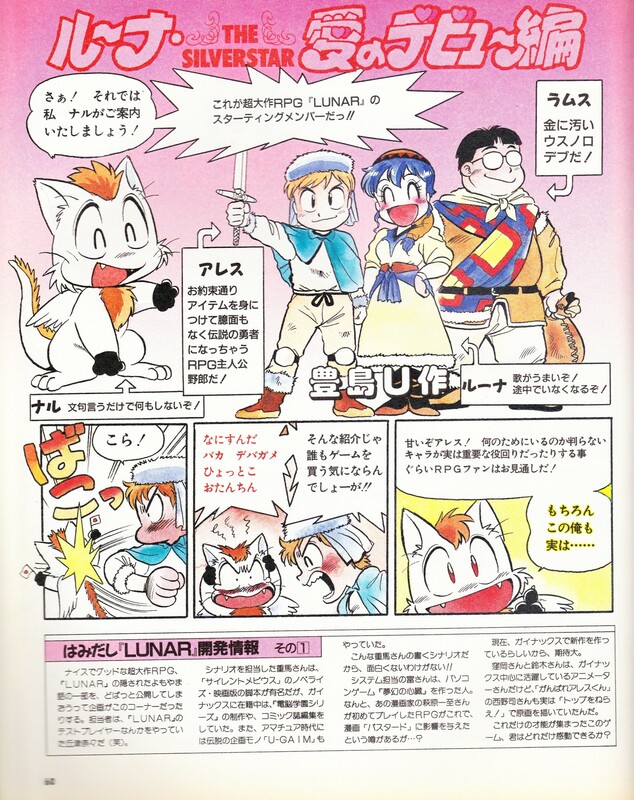 (Manga feature 2) Lunar: The Silver Star, Love's Debut. Page 2/4. 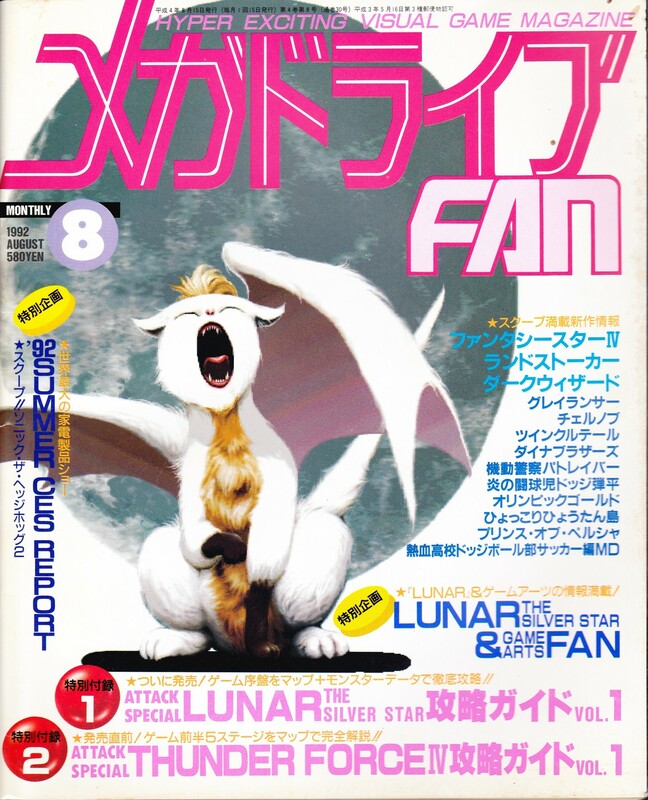 (Manga feature 2) Lunar: The Silver Star, Love's Debut. 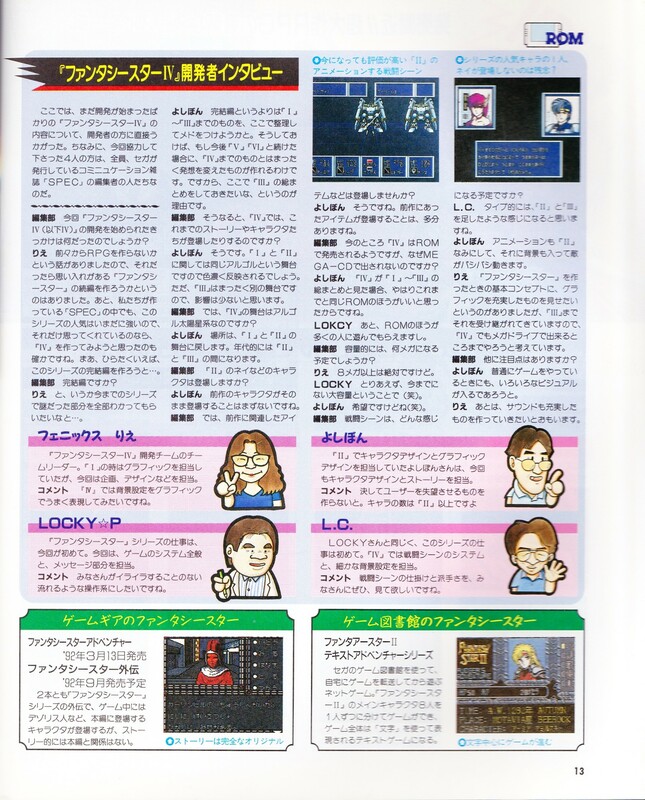 Page 3/4. 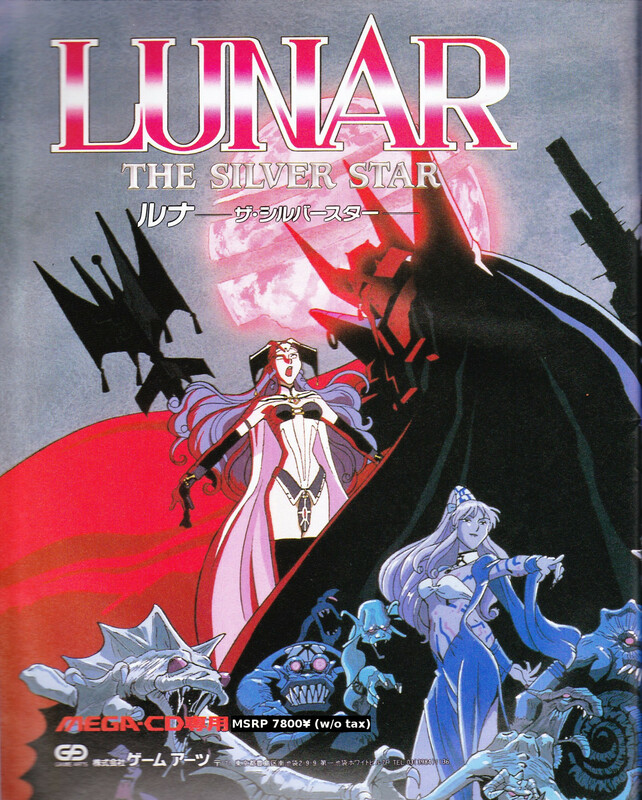 (Manga feature 2) Lunar: The Silver Star, Love's Debut. Page 4/4. 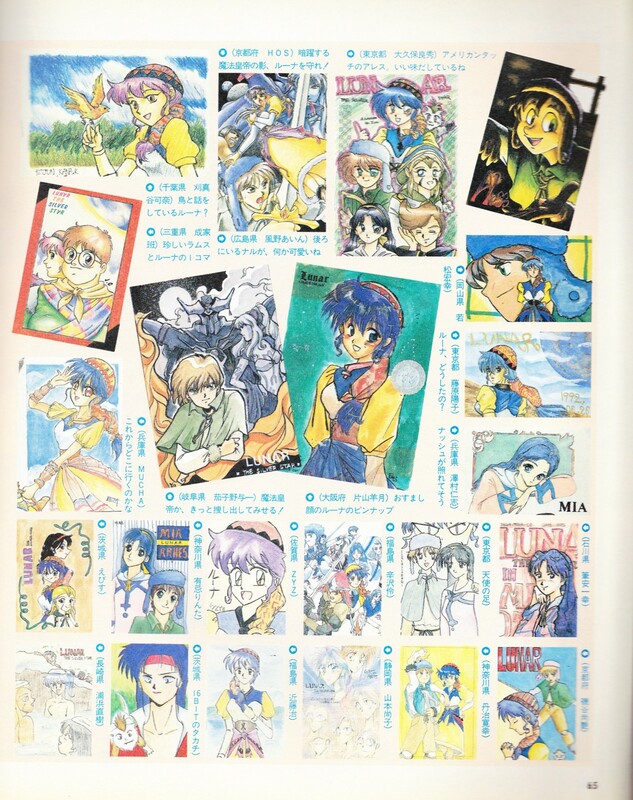 (No translation available) Fanart section. 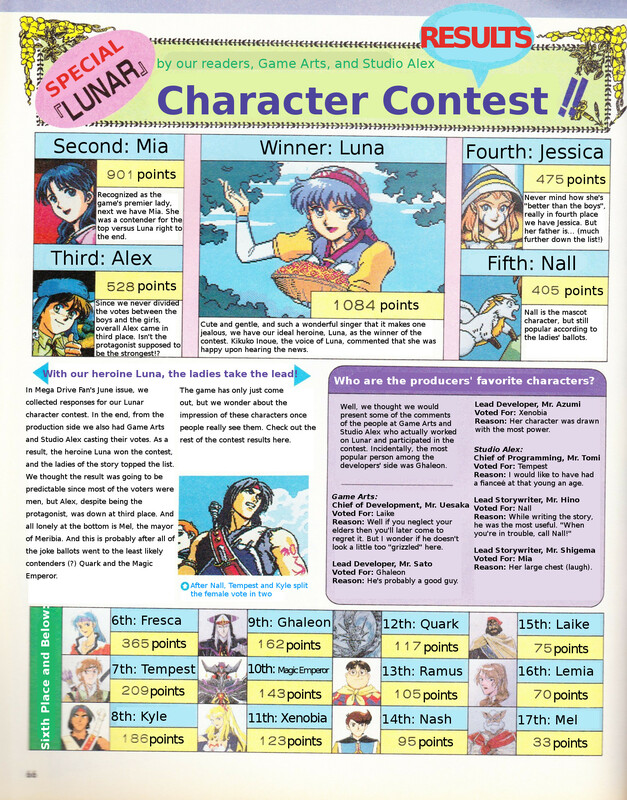 Results of a character contest involving MD Fan readers and some Game Arts and Studio Alex staff. 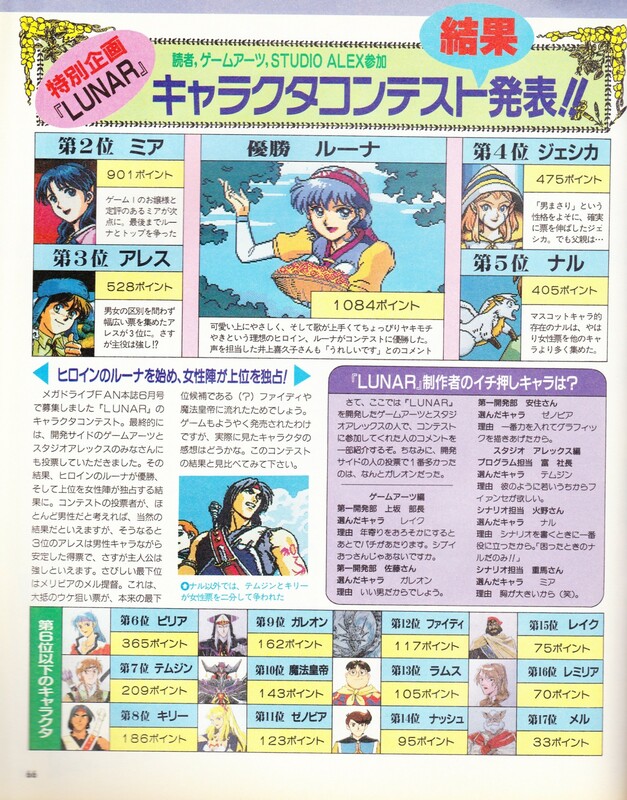 (No translation available) (Story feature) Lunar: The Silver Star, The Snake Ring. Page 1/5. Original story by Takashi Hino. 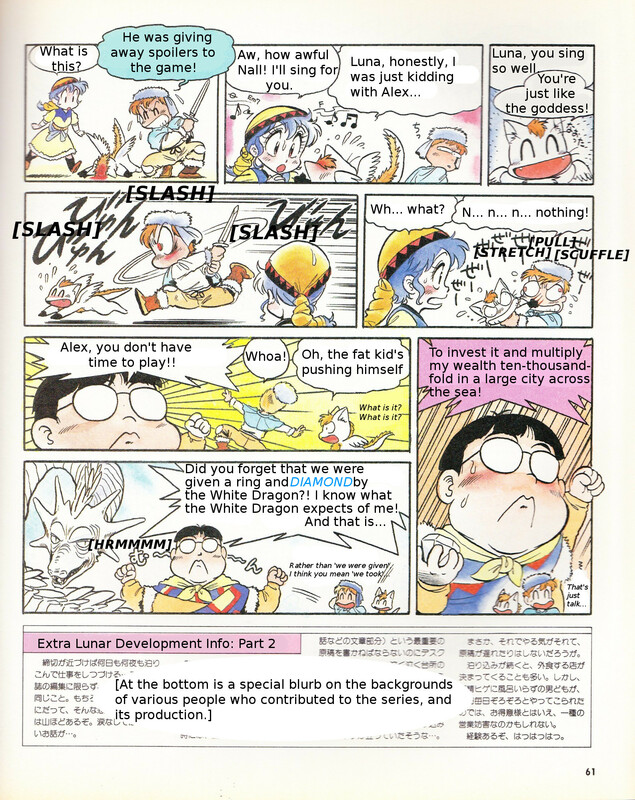 Illustrations by Toshiyuki Kubooka and Shunji Suzuki. 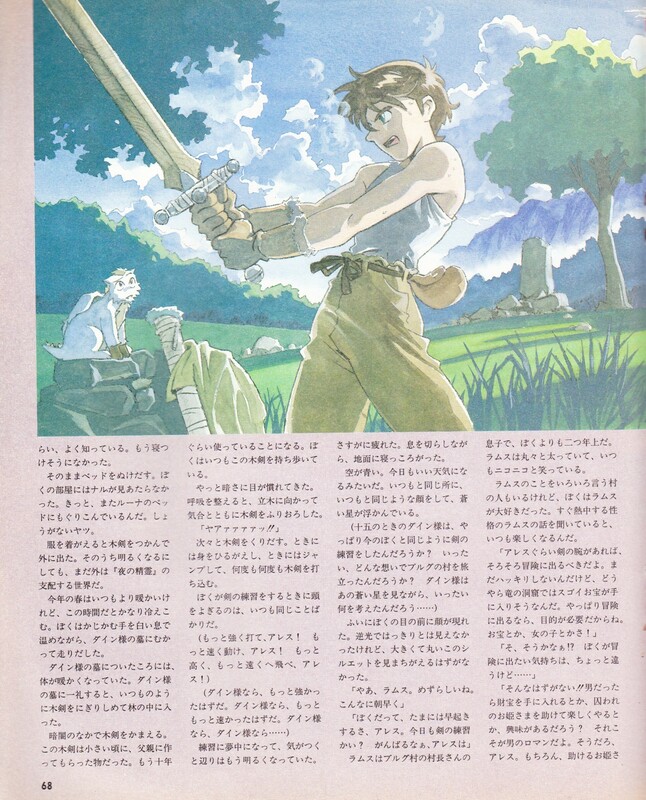 The headline: "One more short story, before Alex set off on his adventure". 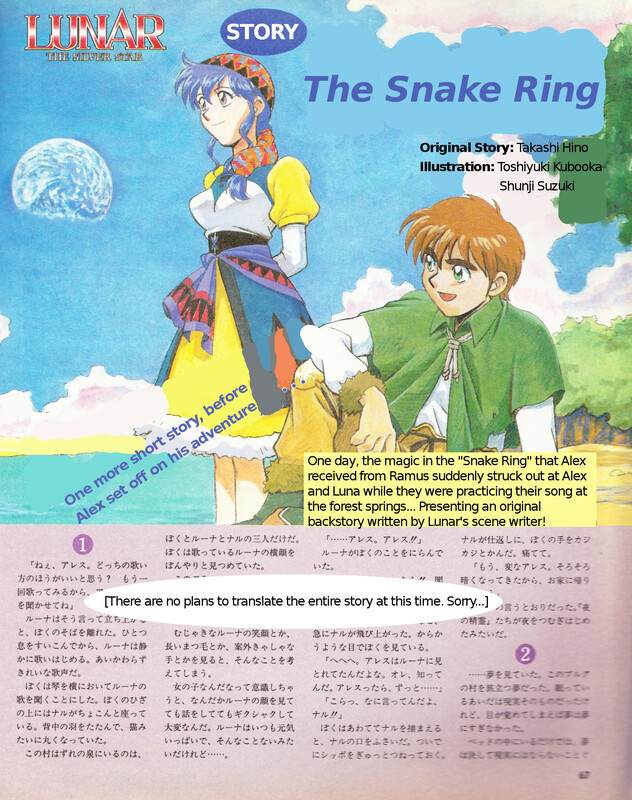 The introduction: "One day, the magic in the 'Snake Ring' that Alex received from Ramus suddenly struck out at Alex and Luna while they were practicing their song at the forest springs... Presenting an original backstory written by Lunar's scene writer!" 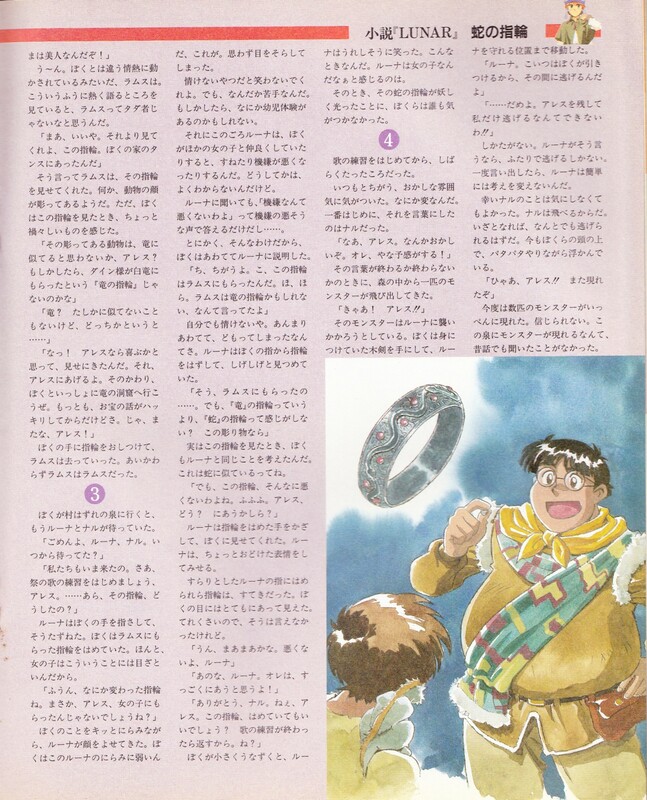 (No translation available) (Story feature) Lunar: The Silver Star, The Snake Ring. Page 2/5. 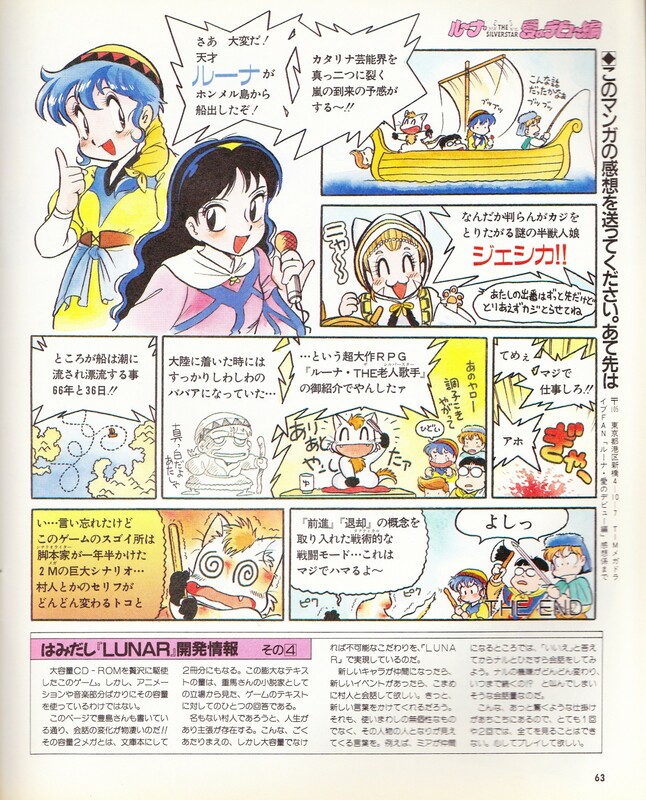 (No translation available) (Story feature) Lunar: The Silver Star, The Snake Ring. Page 3/5. 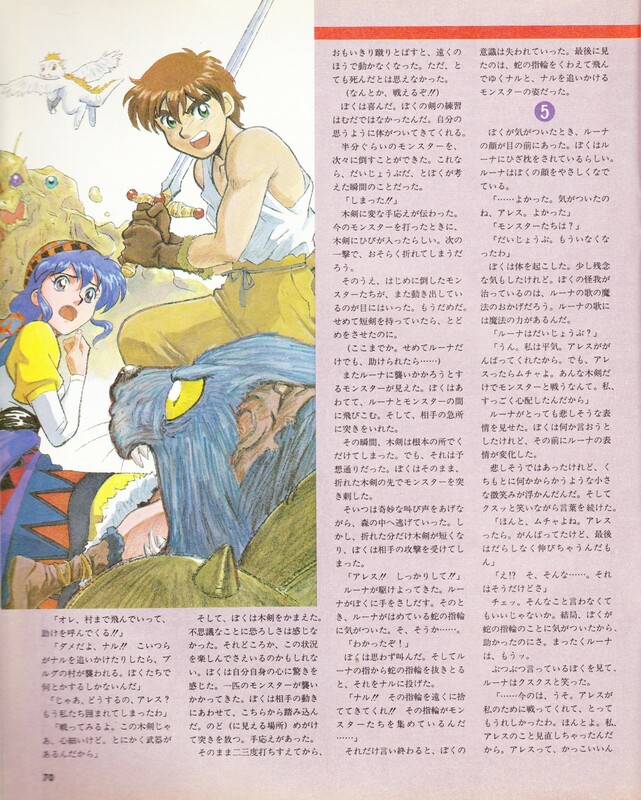 (No translation available) (Story feature) Lunar: The Silver Star, The Snake Ring. 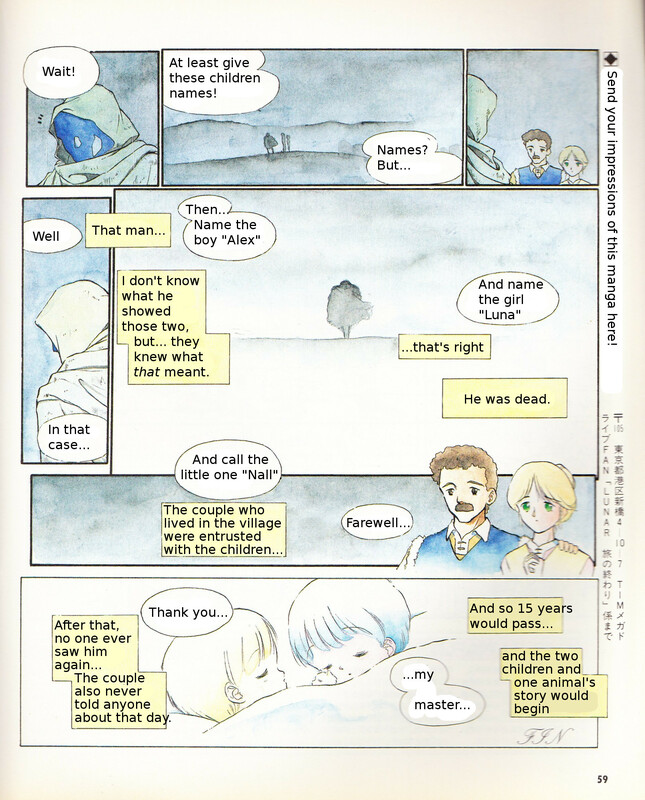 Page 4/5. 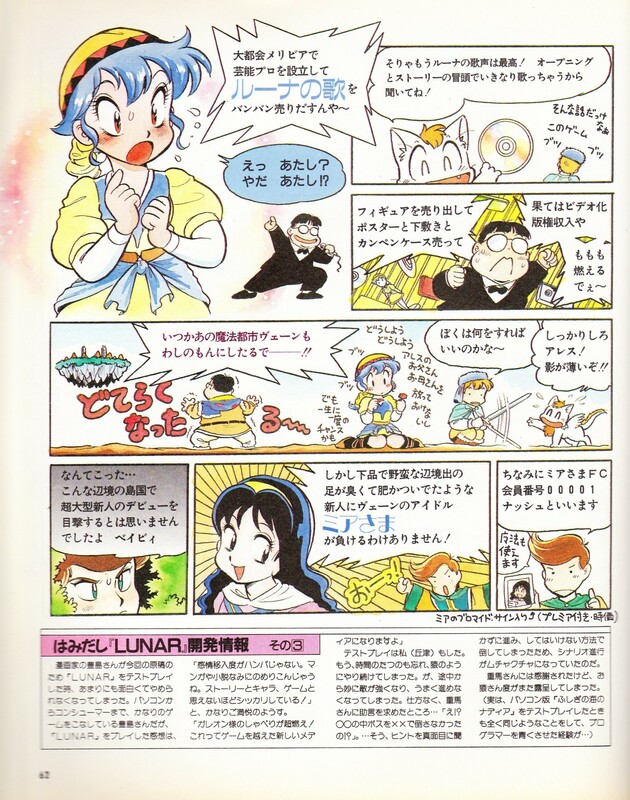 (No translation available) (Story feature) Lunar: The Silver Star, The Snake Ring. Page 5/5. 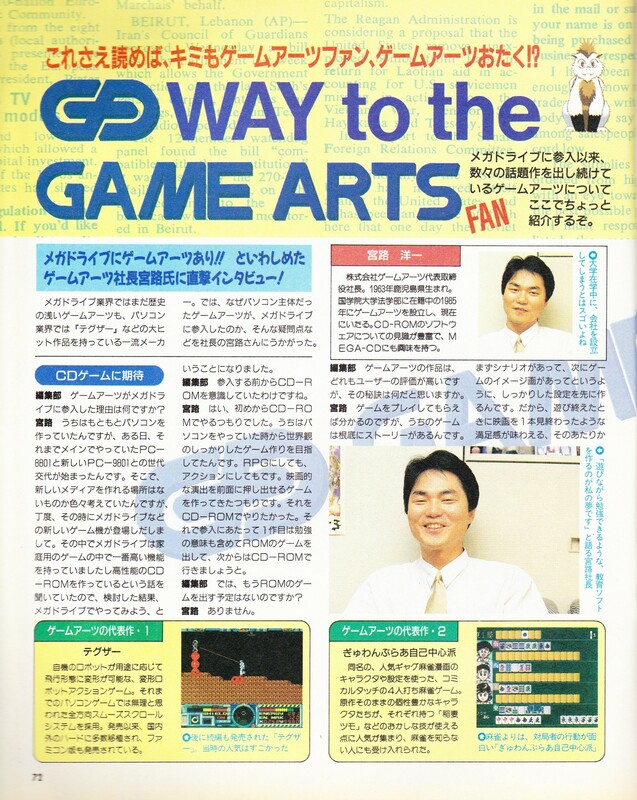 Special feature on Game Arts. This page has the first part of the interview with Youichi Miyaji, president of Game Arts, and some smaller blurbs on two of their past games. 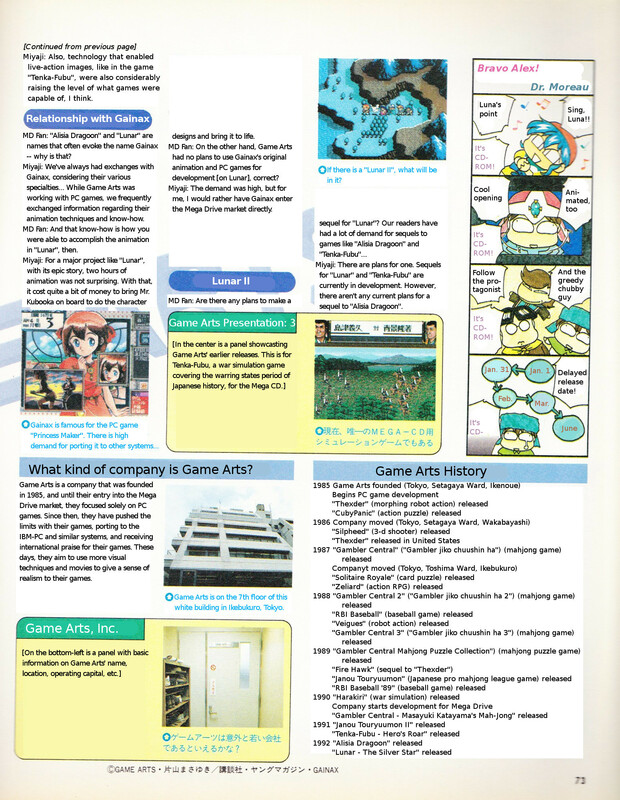 Special feature on Game Arts. 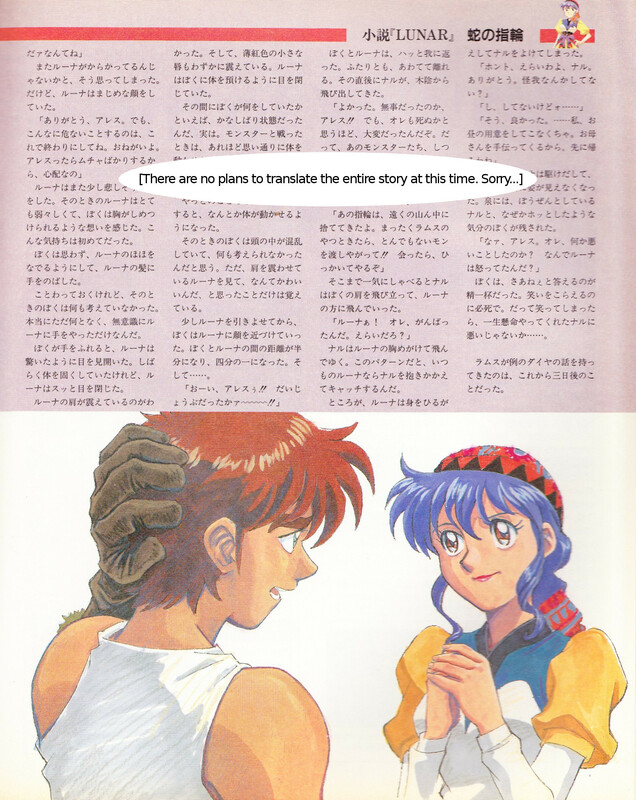 This page has the second part of the interview with Youichi Miyaji, the history/past releases of Game Arts, and a 4-panel comic. 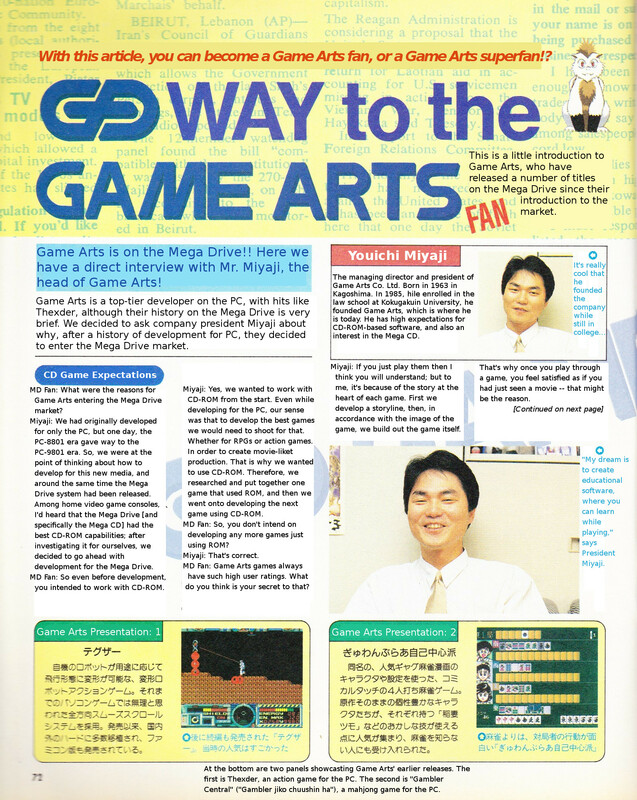 Special feature on Game Arts. 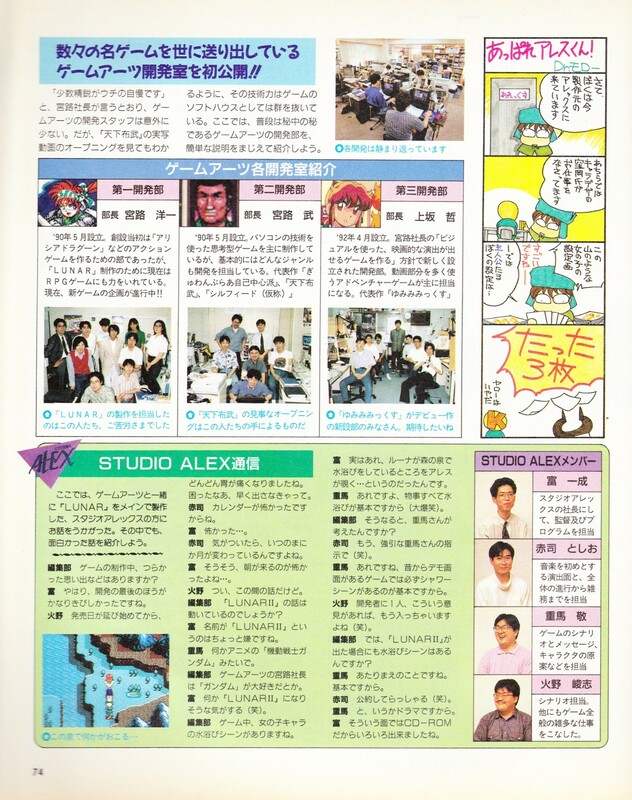 This page has descriptions of the development teams, an interview the members of Studio Alex (including Kei Shigema), and a 4-panel comic. 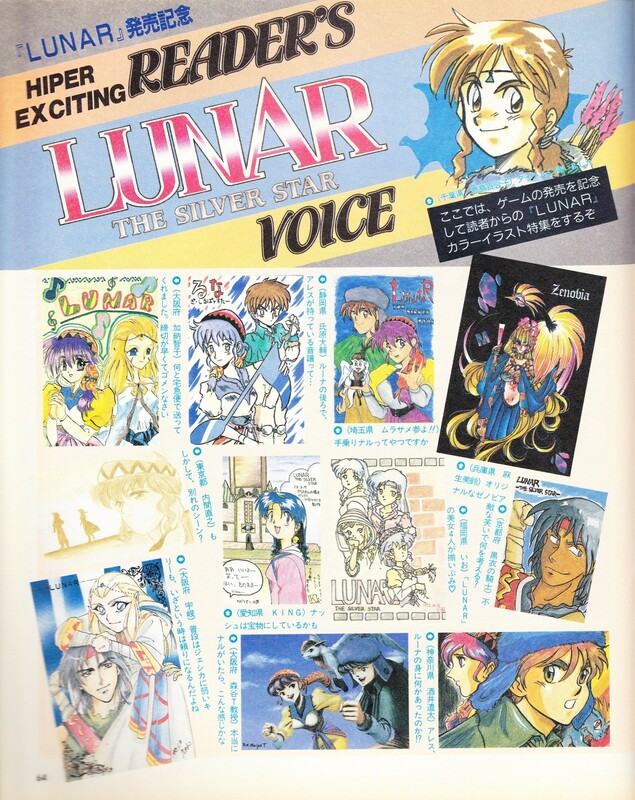 Two-page advertisement for Lunar: The Silver Star.